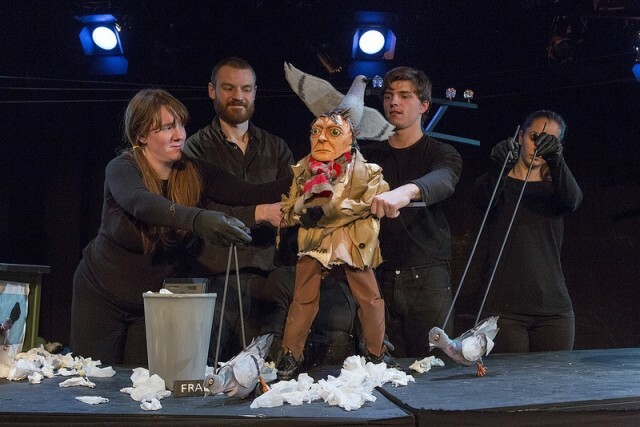 The Pigeoning is a darkly comedic puppet piece about a neat freak who becomes convinced that pigeons are plotting against him. The play was created by Robin Frohardt, with music by Freddi Price. The Pigeoning will premiere at the Festival of Firsts in Pittsburgh, October 8 to 12, 2013. A New York City premiere will take place in December. From the start Frank is obsessed with order and cleanliness and is a diligent student of the Office Safety Videos. He is consumed with a series of habitual cleaning and ordering routines. Pigeons are a part of Frank’s daily life and serve as the embodiment of the chaos and filth of the natural world. As his story progresses, they seem to act against Frank, behaving as a continual source of aggravation for him, until he begins to believe that the birds are actually plotting against him.